Hey all! I started an internship this week and so far it has fun and awesome and tiring and the number one cause of needing food in my world, so I decided to make a bunch of muffins for snacks and breakfast and like food. Since blueberries and lemons were on cheap at the amazing fruit ‘n’ veggie store near my subway station, I made blueberry-lemon muffins – read on for the recipe! Preheat oven to 375F. Combine the dry ingredients, set aside. In a large bowl, put the butter and eggs in and like mash it around with a spatula in a poor imitation of creaming it; stop when the butter is in small chunks and your dignity is in slightly larger ones, and decide that trying to do this without white sugar was kind of a bad idea. Soldier on, adding about 3/4 cup of honey (if you’re dangerous like me, you can just eyeball it ) to the wet stuff, and stirring it in. Now would be a good time to add the vanilla, too, not right at the end like this genius right here. Add about 1/3 of the dry ingredients to the wet ones and stir it about until mixed, then add enough soy milk to make the batter pancake-like again, add the next third of dry, rinse, and repeat. I honestly have no idea how much soy milk I used here, but I’d roughly estimate one to two cups’ worth. You basically want your end result to have a consistency that allows it to pour smoothly off the spatula, but not so thin as to make pancakes with it. Good luck. 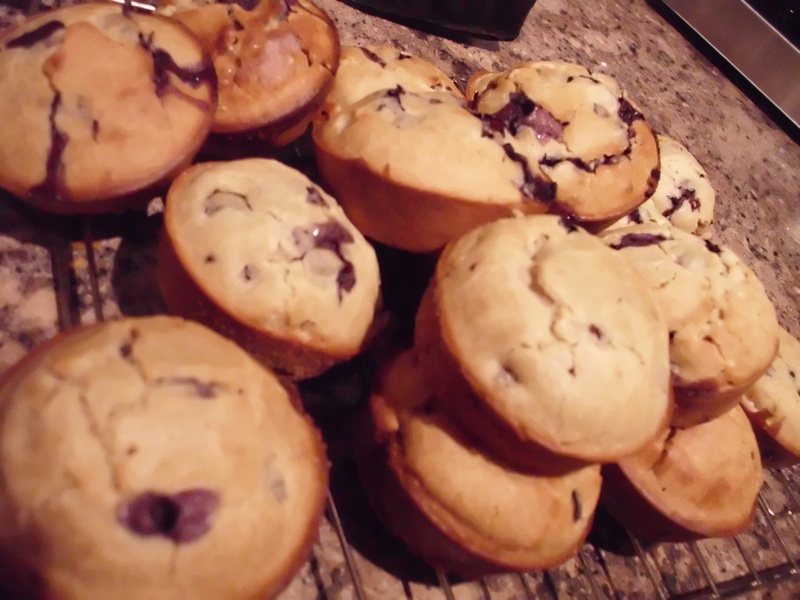 Fold in your lemon zest and blueberries, then transfer the lot to greased muffin tins (or the paper cups therein). Test out the taste of your batter before making the transfer, though – you may want to adjust vanilla, honey, etc. Pop them into the oven and wait for about 25 minutes, then check ’em. If your oven is a secret jerkface, spend the next few seconds getting over the fact that your muffins are a bit crispier than intended. Using a knife, get them out of the pan and on to a cooling rack. They’re not as sweet as I’d like, but I’m also probably close to having diabetes considering all the Easter chocolate I’ve been eating lately, so your mileage may vary. Nothing some jam can’t fix – the blueberries themselves are very tart and sweet, and the lemon zest comes across really well. It’s a great combo of flavours, and I’m psyched to be eating these all week! 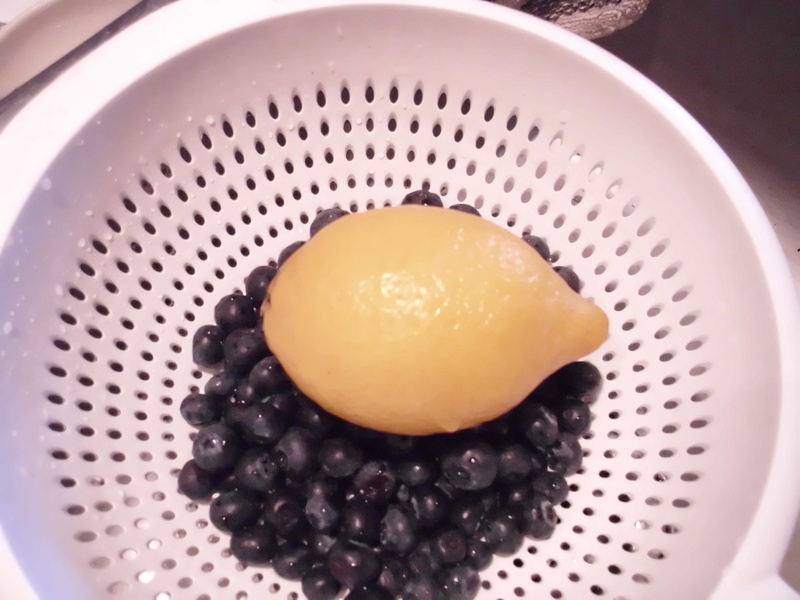 Lemon and blueberries…two of my favorite ingredients! Thanks for sharing.